Frank Lloyd Wright started building his 'Usonian' homes in the 1930s: simplified developments from his earlier prairie houses that brought his redesigned, open-plan ways of living to a modest size and budget. The Usonian community at Pleasantville is relatively late in Wright's development: he developed the master plan in 1947. Fifty Usonian-style houses, with much variety within the common theme, are spread around 100 acres of woodland, with common land and facilities shared as a cooperative. 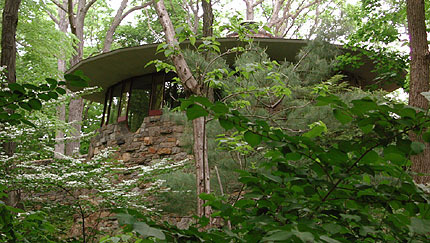 Wright personally designed three of the houses, of which two are more or less unchanged today. 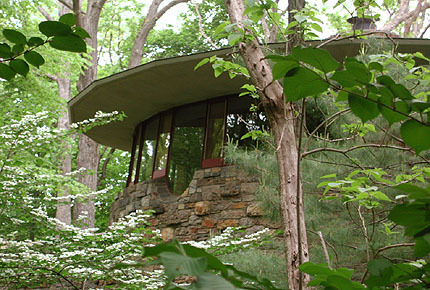 The Friedman House forms part of the development of Wright's use of the circle, culminating in his Guggenheim Museum in New York. The house is a private residence and is not open to the public. Since it is built on a spacious, wooded plot, it is only partially visible from the road (especially in summer among the leaves). Orchard Brook Drive is on the east edge of Pleasantville, which is in Westchester about an hour's drive north of Manhattan. The easiest way to navigate is to approach Pleasantville along route 120 (from the I-684); then Orchard Brook Drive is a simple left turn off this road (if coming from the south). See driving map. The Reisley House, the other Wright Usonian home in the neighborhood that is still in its original form, is just around the corner at 44 Usonia Road. From Orchard Brook Drive turn right into Usonia Road. A personal account written by the resident of the neighboring Reisley House, who was Frank Lloyd Wright's client in 1951. A highly readable, generalist account of the influences, development and innovations of Frank Lloyd Wright's architecture, well illustrated. A practical visitors' guide to thirty six publicly accessible Frank Lloyd Wright sites, with a straightforward one or two page description of each, with black and white photographs. Note: Does not include this private house. www.geocities.com/SoHo/1469 provides both its own Frank Lloyd Wright content and a set of links to other Frank Lloyd Wright sites on the web.